Don't forget thay your MySQL installation must be configured in a certain way to be compatible with XEO. The first step to deploy a XEO Application is generating an EAR ( Enterprise Archive). 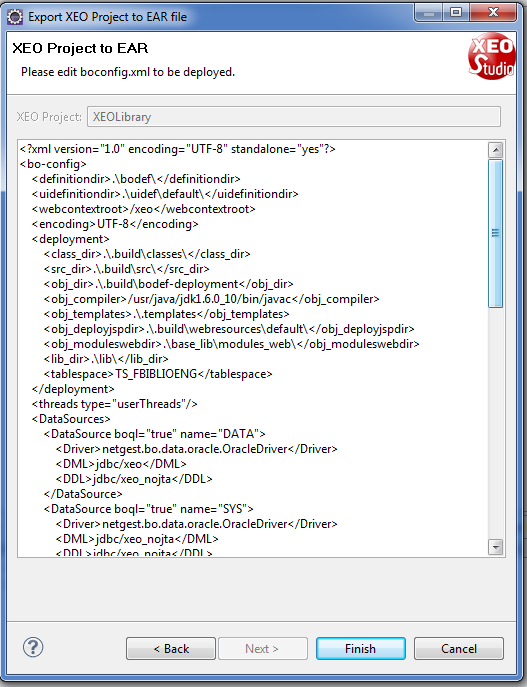 XEO Studio provides a wizard to export a current project to an EAR file. 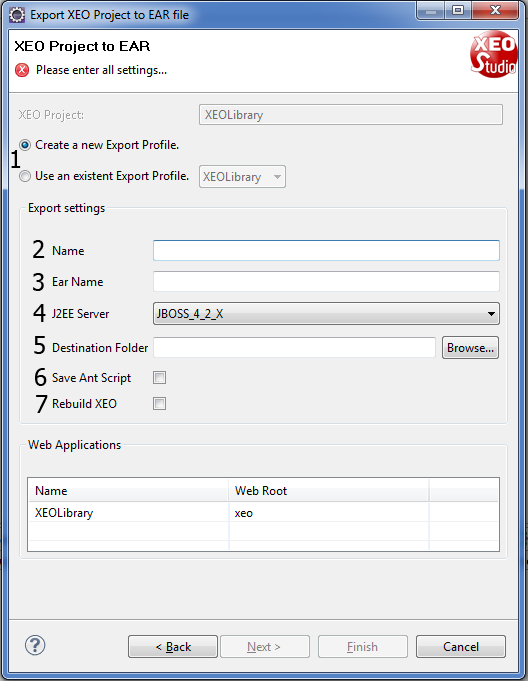 In order to export a XEO project to an EAR file you need to select the "File" menu and choose "Export", find the "XEO Studio" folder and choose the "Export Project to EAR" option, which in turn will open a new window depicted in figure DeployEar.1. The Export Profile, you can reuse an existing profile or create a new one. An export profile basically saves the selected options for later reuse. The name of the profile (which will appear in "Use an existing profile" combo box the next time you run the wizard). The name of the .EAR file to be generated. If an ant script with the operations to create the EAR file should be saved for later reuse. If the XEO Application should be rebuilt (XEO Builder invoked) before creating the EAR. In figure DeployEar.2, the step 2 of the EAR exporting process, you're presented with an interface to customize the boconfig.xml file for the current export. When you press finish, XEO Studio will generate the EAR for you and place it in the directory you chose. Two different boConfig (development and production)? An important notice: This tutorial is not about installing and configuring J2EE Servers (nor about generic deploying of a J2EE application in one of those servers), that kind of information can easily be found with the help of google. Download JBoss 4.2.3GA from JBoss and extract the package to a directory. Configure the data sources for the current application. For more information on configuring DataSources with JBoss, visit JBoss's documentation page about datasources. After configuring the data sources, you can now execute the run.bat (Windows) file to launch the JBoss server and execute the application, which will be accessible on http://localhost:8080/xeo/Login.xvw (8080 is JBOss's default port).